In 1995 the UK’s Warp Records put out the much loved ‘Elektroworld’ album by Elecktroids. 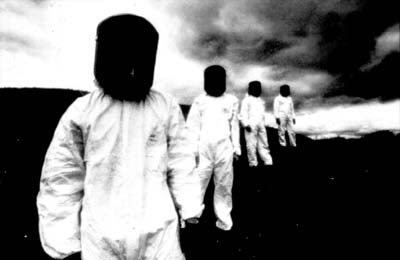 Today Elecktroids are widely known to have been a side project related to one or both members of Drexciya and possibly two others. At the time however I’m not sure how much was revealed to the press and public about its authorship. There was a press release/statement which restated the albums linear notes under two headings which read, ‘Background: based in Flint, Michigan, USA, the four young sons of an electrician, known simply as the Elecktroids, have welded together their debut album.’ and ‘Inspiration: this album, titled 'Elektroworld', is a personal tribute to those well known pioneers of the electro-disco-beat; Kraftwerk.’ From this, outside of knowing we are at least dealing with musicians from the state of Michigan we learn nothing more of the fact that we are actually hearing work from some other musical pioneers more usually associated with its capital, Detroit. These notes are all a bit of fun anyway, in keeping with the pop sensibilities found on the album. Warp had just previous to this released the now infamous and powerful trilogy of 12” singles which were united by their artwork and Drexciyan links, these being Drexciya’s ‘The Journey Home’ aka ‘Drexciya 5’, the debut Ultradyne release, ‘E-Coli’ and Elecktroids themselves with ‘Kilo Hertz’. So it would have been obvious from this to those paying attention who the parties responsible for this album were likely to be. If that were not enough, 4 years later it would become even more apparent when the un-credited bonus track found on the CD version of the album turned up on Drexciya’s ‘Neptune’s Lair’ as ‘Triangular Hydrogen Strain'. Today there is still much debate about who exactly was responsible for the album and unfortunately or not I am going to have to add to that by speculating on the specifics myself. I would plumb for ‘the four sons of an electrician’ being most likely Drexciya’s James Stinson and Gerald Donald and Ultradynes Alex Lugo and Dennis Richardson, there-by creating the link between the two undisputed artists featured on the aforementioned 12“ series. This is the most obvious and certainly the most likely scenario going by the available information. Unless they just wanted to give the impression of having four members like Kraftwerk, which is a strong possibility. If Ultradyne or even Donald himself would make a comment on the matter this issue would be closed but if they don’t they can only expect people to continue to come to their own conclusions. But of course they won't resolve it, they understand that we secretly and not so secretly love not having all the answers, as providing finality in anything only hastens our interest coming to an end no matter how good the music is and in Elecktroids case mystery is all we have left. Kraftwerk understood this principle as well and it really came into its own for them when they would take their extended breaks, always returning to the increasing anticipation of new and old fans right up to the present day. Just think how long Drexciya have assured their place in history by not fully explaining themselves. So next time you see some latest big thing giving MTV or whoever an 'all access' glance at their working methods or touring operation just think how much more quickly their fans will tire of them and then marvel at how completely they seem to disappear afterward their 15 minutes has passed. The artwork doesn’t tell us much either as four masked and boiler-suited people pose on a hill side. It’s very effective artwork, hard to put a time and identity of these residents of this electro world. But it’s so anonymous we can’t tell whether the shots were staged by Elecktroids themselves or by some mates of whoever did the artwork. I’m sure someone at Warp or The Designers Republic knows, but of course it’s not important. One thing which does very much link this album with Kraftwerk’s ‘Computer World’ is the home computer style type faces and even the yellow background colouring. Not to mention the all important four members in the photograph. There is also a 'special thanks to God' credit in the text as well, which is of course a common Drexciya credit. So, the artwork has done its job, what about the music? Well, first off, going by the production it doesn’t really tell us much about its creators either, there’s certainly no Ultradyne signatures to my ears, it’s a far more Drexciyan sounding affair but is distinct even from them in that you can actually hear more echo’s of their later work than anything they had done up to this point. The vocal of ‘Midnight Drive' for instance sounds like a close cousin of tracks to be found on 2001’s The Other People Place album. That’s all I will say on this issue except to point out I have previously written in the AKA article that the members of Drexciya worked with Ultradyne on an early version of ‘Wave Jumper’ which would appear as the track ‘Crossphaze’ under the name X-Ternal Pulse in 1993 and that I personally doubt they would still have been collaborating with them by the time of the ‘E-Coli’ EP. Are they present here, I really couldn't say for certain. Regarding Kraftwerk, the album title most clearly references their 1981 album 'Computer World'. which would also be one of their two albums most generally considered their most obviously influential on electronic music. The other being the 'Man Machine'(1977) and not forgetting their world wide smash hit single 'Tour De France'(1983). Of course each of their albums from 1975 on were an essential stage in the development of electronic music but if you just want to check out the ones displaying the 'electro-disco-beat' them those are the ones. If there's a Kraftwerk track that Elecktroids took as a template then in my opinion it would be 'Home Computer' from 'Computer World'. Really this one has it all, from regimented computer funk drum programming to weird atmospheric sections. Its vocal also concerns the future, '...Beam myself into the future', which is an obvious Elecktroids theme. Also if you listen to those big sad keyboard lines which begin from the one and a half minute mark on 'It's More Fun to Compute' from the same album I think you get a big Drexciya vibe. The agenda of this album is clearly and unequivocally stated with the continuous looping of a robotic voice saying 'Welcome to the Future' on the opening 'Future Tone'. This after-all is a more than fitting sentiment to express as we enter this 'Electroworld'. How self-contained this concept is we shall see as the album develops. Musically this track is accessible enough and on close inspection does indeed have a continuously rising tone as one of its signatures. The echo on that fairly bare snare is the type of sound that on first listen would give rise to certain people saying things like 'old skool' but there's a lot more going on here than that. It's a solid opener that sets our expectations for the album up fairly well, eg. more vocals. 'Perpetual Motion' sound s quite Drexciyan, somehow aquatic, an instrumental it boasts a number of rhythms lines and is finished with a few textures of synth. Without any strongly recognisable element however it’s a bit of filler really, but at almost the 6 and a half minute mark it just about keeps your attention to the end. ‘Japanese Elecktronics’ more than makes up for it though. Every track on this one has that something special about it. Great and very memorable bass line, the “Japanese Elecktronics” vocal sample itself, loads of lovely touches contained on the keyboards, especially towards the end, I hesitate to be so literal as to call them oriental sounding but yeah hey do. Of course the title of this track does pre-empt Gerald Donald’s interests in Japanese technology which he began to explore more obviously with Japanese Telecom and Arpanet but you could also point to work that was more contemporary with this time period with Flexitone and even Dopplereffekt. Certainly the makers of this track are acknowledging and enthusing Japan’s superior electronics. I wonder how much of their equipment originated in that country? 'Check Mate’ is up next, the production is good on this one and the melody pleasant if a bit throwaway. It’s just a loop, effective of course and maybe perfect for that. Maybe someone with a better ear can decipher the last word of the vocal sample, ‘Check mate ...?’. If it even says that, it’s very clipped. I guess it’s worth considering that if there really are 4 people at the controls you might expect far less of this fairly ordinary stuff getting through but it can go either way, too many idea’s diluting the consistency you need to sustain an album, to include a bit of everyone’s input to be fair even if better idea’s have to go by the wayside, or the majority over ruling what might have proven to be a better idea if allowed to develop. Of course any true collaboration is just that and if a struggle ensues then that's all part of it and resolving the differing opinions and inputs into a cohesive whole that goes beyond what an individual could have achieved is the ultimate goal. My own gut feeling is that this is simply James Stinson and Gerald Donald working together and in isolation. ‘Mystery World’ sounds very much like something from ‘Neptune’s Lair’. It even has that same unfinished abrupt, read short, quality that many of the tracks on that album have. At the one minute mark it has a lovely floating synth sound which is one of the high points on the album for me. About the four minute mark there’s another huge change into what actually sounds like it would fit a David Lynch movie soundtrack. Going by the title I’d nominate ‘Blue Velvet’. This is an outstanding track, amazing melodies and a really great production with these big surprising changes happening seamlessly. ‘Silicone Valley’ is out of this world, a timeless piece of music that could in 50 years be used to sell you a futuristic product or something in that context. Don’t forget this is already almost 15 years old as it is. They really managed to find the magical ingredients on this one and no mistake. The aforementioned ’Midnight Drive’ is another beautiful track for different reasons , a very smooth sounding male vocal which could be singing anything really, “5, 4.30, love?”, it’s not that but it could be. I guess it doesn’t really matter as the sentiment is undoubtedly melancholic and highly effective. To date there had been nothing like this from Drexciya and there’s certainly nothing else like it on this album so it’s doubly surprising to find it here. Whenever Drexciya decided to create the Storm Series and knew that they would be covering a number of styles I wouldn’t be surprised if a chance to return and expand upon the template of this orphan was a long cherished project. ’Thermo Science’ gives me more of a Gerald Donald production feel, with even the vocal being one of his interests. It has a sense of fun in its production which also links up with both Glass Domain and even the more absurdist side of early Dopplereffekt. It’s a worthy track, maybe incomplete to some degree, a bit stuck in its own groove. More humour, if you choose to interpret it as that on ‘Stun Gun’. Love the bass line on this and the double vocal sample, ‘I got a stun gun’ is a hoot when it gets going. Plenty of arcade game style gun sounds ricochet throughout as well. ‘Floatation’ is another track which kind of pre-empts the future, all I know is that it sounds like the future to me, it’s at least contemporary with what is going on today. I guess it might have some very minimal Drexciyan elements but basically it’s another attempt at a brave new sound. The final official track, ‘Time Tunnel’, begins “Logo rhythms, Algo rhythms, multiplication, linear integration.” A male vocal, wonder if it’s Donald? A very sparse track which soon develops into a tight little bass-line led number with plenty of snare and echoing beats throughout. It also has a very nice dark ending which is drenched in reverb and just when you think it's over there is one final mysterious male vocal, "When number 9 extends into infinity, in either direction, positive, negative." Thus are we left hanging, unless you have the CD version which has the aforementioned ‘Triangular Hydrogen Strain' by Drexciya five minutes later which then leaves you hanging for 4 more years. So to sum the album up in a line, this is a tribute to Kraftwerk which doesn't sound like them musically but does follow their pioneering spirit. Musically there are loads of tracks that sound like they might have appeared on 'Neptune's Lair' in time if this release had not been so it's interesting in that sense. Does the future concept tie together throughout? Sure, basically it's a simple enough idea and can stretch to include a lot. The ‘Kilohertz’ 12”, long one of the most sought after and therefore most expensive of Drexciya related rarities brought 4 other new Elecktroids tracks to light. The opener, ’Kilohertz’ itself, is an instrumental, as all the other tracks are but does feature what seems to be like a very familiar sample which I believe started off life as a child screaming. Its strongest element is the bass line and more high frequency bleep melody. A few unexpected sounds too but all of the home-computer type variety. My favourite and for me the most distinct sounding track is next. While ‘Algorithm’ does have a certain flavour of ‘Neptune’s Lair’ to it in my opinion it also has its own style which sets it apart from anything previous to it and even since. Keyboard driven and with an unexpected breakdown halfway it shuttles along on it own momentum. It could lay claim to one of the few tracks with a slight, very slight Kraftwerk sound but only towards the end. ’Magnetic Field’ is a surprise in that it’s fairly hard and reminds me of material found on their first 12” ‘Deep Sea Dweller’. Still fairly sparse and at just the 2 and a half minute mark it is a bit throwaway, far from their best work. Check out the weird ending though. The wonderfully titled ’Remote Control Hornet’ closes the EP and comes a close second to my favourite track here. Again I can detect a lot of sounds and programming on it that would not have seemed out of place on 1999’s ’Neptune’s Lair’. Quite a dark brooding track but also with a quirky upbeat charm which is really the description of classic Drexciya. All in all a tasty collection and companion to the album. The artwork here does not follow the album and is simply a small square shot of I would guess the famous Hal 9000 computer eye from the Stanley Kubrick film 2001 with red as its primary colour. There may be what appears to be a human figure reflected in it. As mentioned the other two 12”’s in the series also had similar artwork. At the moment all of these tracks are available for download from Warps http://www.bleep.com/ site but as indicated by the high prices these items attain on Ebay they have not been pressed for probably over ten years now. Of course it would be great to see them out there in the shops again, it would make sense to at least expand the CD to include the EP tracks as well. At some stage I can see this happening, it was good to see Dopplereffekt’s ‘Gesamtkunswerk’ getting another outing through Clone’s Classic Cuts. While many DJ’s have moved to laptop set ups, which is fine and undoubtedly a sign of evolution in that art-form, to actually have it back in the shops again and to have fresh clean vinyl versions of this music, the temptation for DJ’s to play it again and for new ones to discover and do likewise is always going to happen. As it would for the Elecktroids material. I’m sure a label like Clone would jump at the chance to put the Elecktroids album out again if Warp agreed to license it to them or more likely whenever the rights return to the creators, whoever they turn out to be. Incidently there was a also a cassette version of the album, guess this is their first time on ferrox odide? Of course if anyone else has more info to add let me know. By the way if anyone is thinking, have I stopped following Gerald Donald’s production progress, I must reassure you that it has only been a temporary break, I will be travelling that road again soon. In fact I can’t wait to catch up with where he is now but as mentioned before we might find it more rewarding to take this more methodical, scientific even, approach. I’m never 100% sure what is next, so barring the discovery of another Heinrich Mueller MySpace project, live appearances or the announcement of yet another Arpanet/Dopplereffekt/Der Zyklus album, there will be always something more to write about as long as he keeps releasing music. Rest assured there will be more text and images for you here soon. Oh, what a fantastic discovery! Yet another fine piece in the Drexciyan canon. got the kilohertz 12" , killer record :). would love elecktroworld to be rereleased. On Ultradyne vs Drexciya: the 2003 release "Age Of Discontent" on PGM includes a Z Therapy remix which discogs says is Gerald Donald. Any idea whether this is true or not? I have the album ever since it came out in 1995 and it still sounds like the future of Electro to me. I always thought that they just sing: "ba..ba..badiaaa on midnight drive (no "real" lyrics). Just like you'd hum a melody. The z-therapy mix on the Ultradyne 12" is definately Gerald Donald. The style is just indistinguishable.